The day of Alpabfahrt is the day of celebration. Another summer season of hard work has come to an end. Farmers march their cows, goats and/or sheep down from the top of the mountains through the village to the winter pastures in the valley. After all the animals are safe and sound in the valley, the day of drinking and eating follows. I was surprised by the number of people that gathered to witness the Kerns Alpabfahrt. I didn’t expect this event to be so popular. 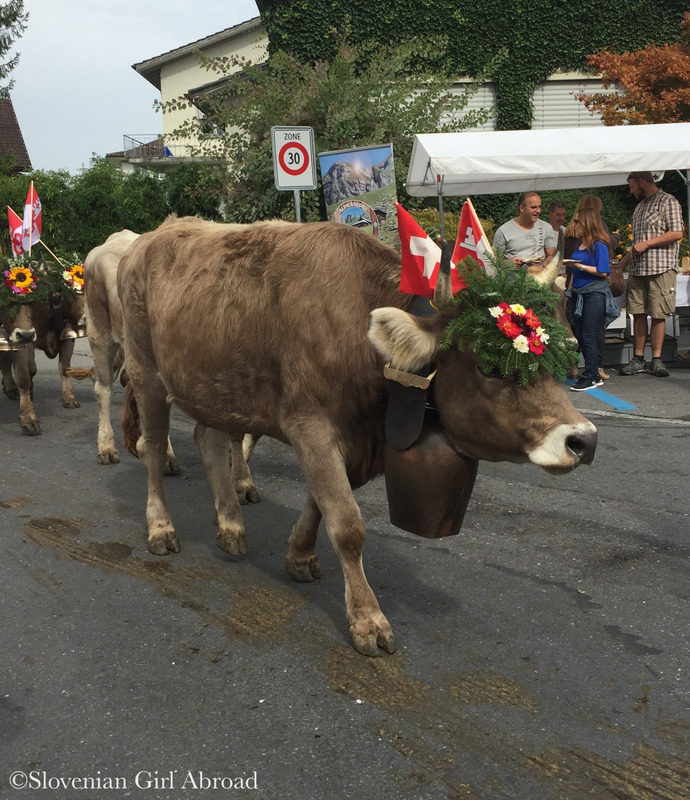 Especially because on the same day Alpabfahrt events were held in many other villages all across Switzerland and Kerns not the most famous village in the region. After our arrival to Kerns my husband and I found our place in the crowd and waited for the cows to appear. While waiting we’d treated ourselves with delicious raclette-sandwich at one of many stalls selling food, drinks and local products. 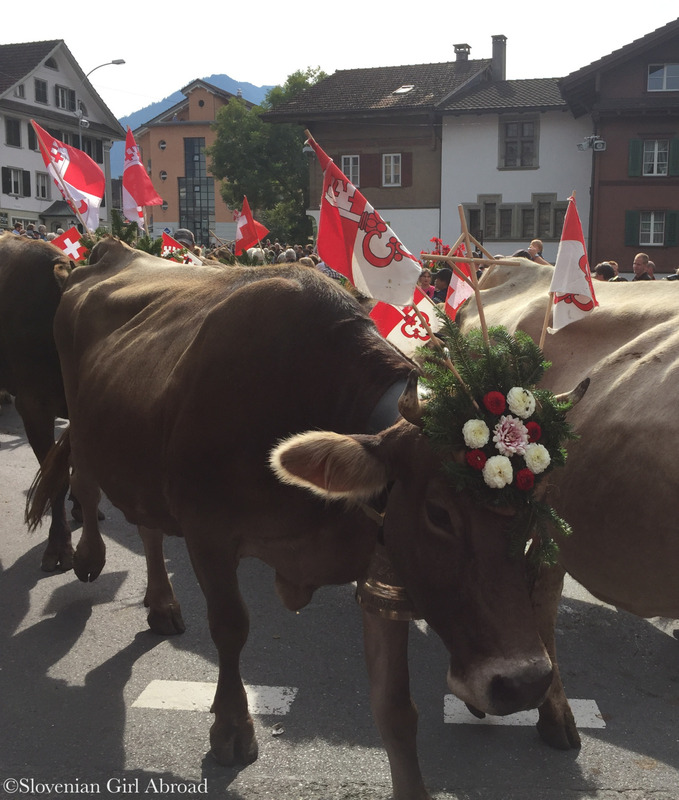 We also bought a slice of the delicious cheese that was made on the mountain from the milk of one of the herds participating the procession. 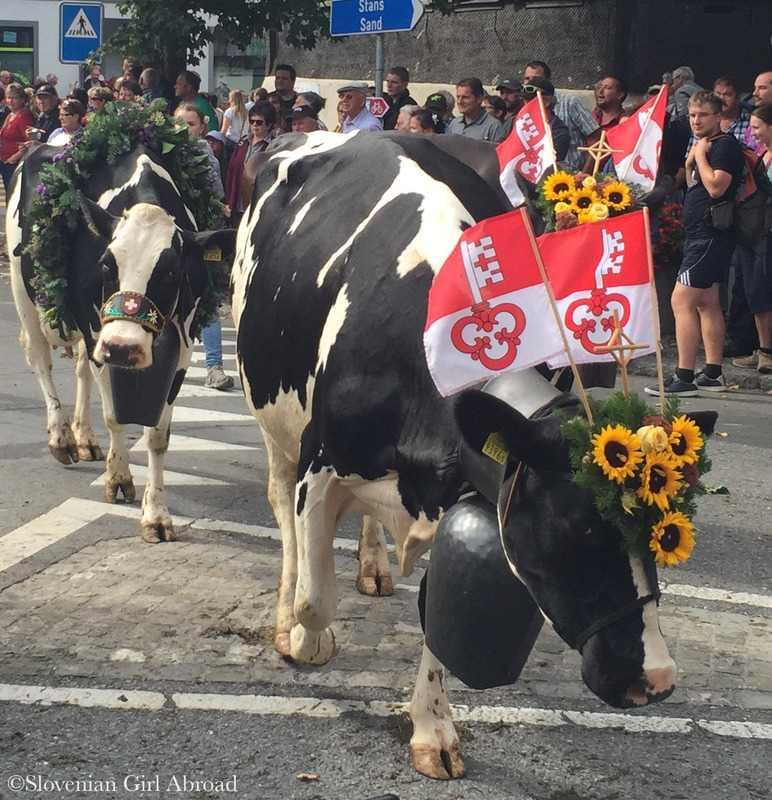 When cows appeared, they were super lovely with their large bells and head dresses made from flowers and flags. But how lovely this old traditions is, looking at the procession I asked myself how animal friendly it is. Some of the cows looked rather stressed. Considering they spent past few months living in quiet and peace of the mountains and on that particular day they were not only forced to leave their home environment, but were also pushed into a situation where they had to face the large crowd of unknown people on the streets. I wonder if that isn’t too much stress for some of the animals to handle. 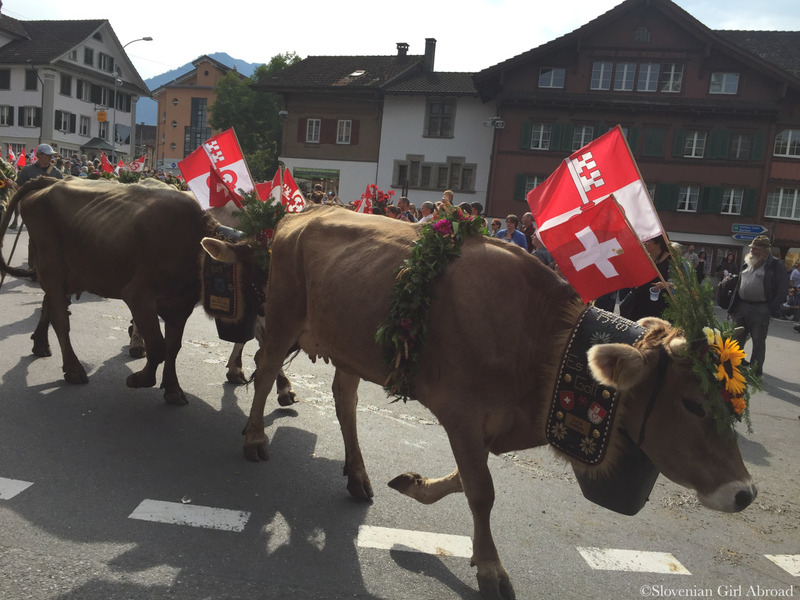 Despite my concerns regarding the welfare of the animals I am glad I’ve attended the Alpabfahrt. Experiencing the atmosphere of this event was definitely memorable experience that gave me better insight into the traditions of the region I am living in. What a charming post! I love the video. It was like a scene out of the book Heidi, which I adored in my youth. What a wonderful experience! I would love to see it one day! I always wonder how comfortable the cows are with those heavy bells on their neck. Indeed it was. 🙂 I don’t know. When you meet cows up in the mountains, they doesn’t seem to be bothered by the bells, but I’m not sure how comfortable are they when they have to carry them all the way down to the valley. I was wondering the exact same thing about the animals being scared. I did like to read the festivities didn’t start until all the animals were put away. Did love your post though. I didn’t know about this Swiss ritual. Thanks for writing about it! Would love to see this – it looks incredible. Great post! Yes, I agree! 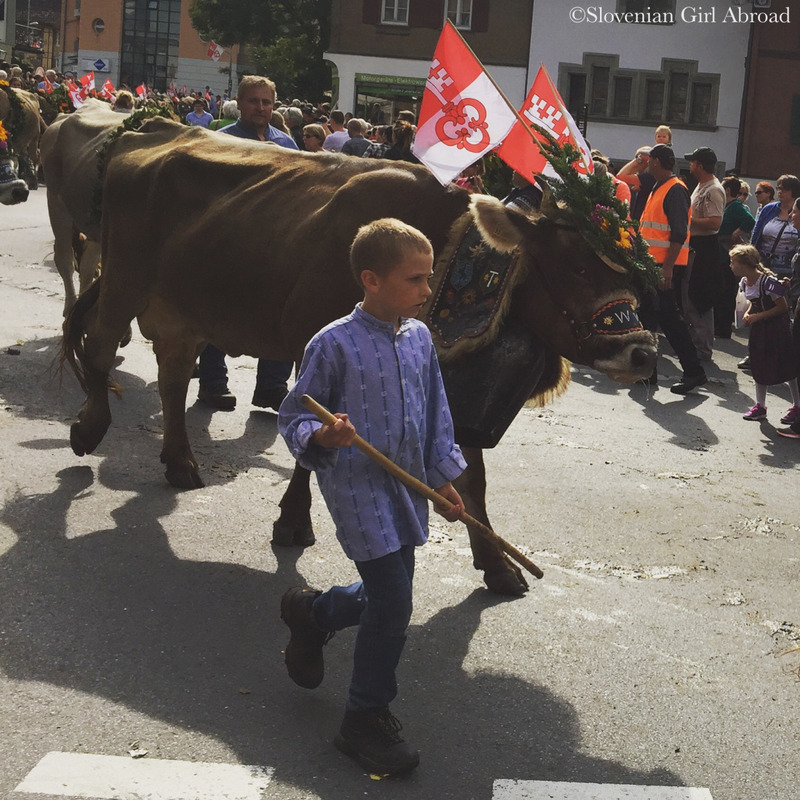 There are similar festivals in Slovenia too – for example in Bohinj. I’ve never been to any of them, but I think they are similar to that one in Kerns I attended. Hi Isabel! Do you remember the name of the show? I believe that I saw it but I can’t remember the name! Thank you! Oh wow – I would love to attend an Alpafahrt! One day…. 🙂 Great job documenting it!